I purchased a GPE HTC One a couple months ago. Recently I had the unfortunate experience of my phone quitting on me. It wouldn’t turn on. I connected my phone to multiple chargers and verified those chargers were working, but it still wouldn’t power on. So I requested a warranty claim. Here is how I went about getting my warranty claim. First off I “Googled” my issues and came up with this site. However, that site didn’t give me any information on how to contact Google, then I found this site . This website had support numbers for various countries. I called Google and got a helpful representative on the phone. She stepped me through a couple troubleshooting steps to confirm the device was dead- it was. Once finished with the questions, she took my information and told me Google would send me an email within 24 to 48 hours. 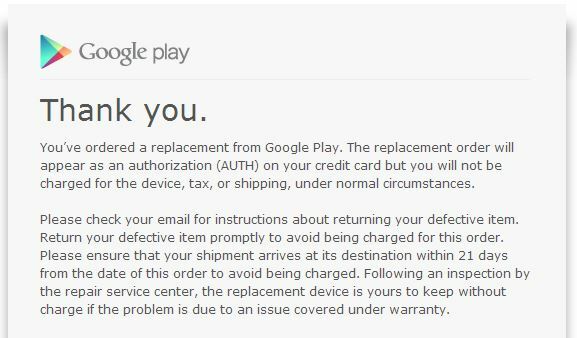 She said the email would contain a unique link to the Google Play store to order my replacement device. I received the email within an hour or so. I clicked the link and ordered my replacement device. Google will authorize the charge against your credit card but will only charge you if you don’t send your defective device back or its wasn’t a warranty issue etc. Within a couple days I received my new Google Play Edition HTC One. 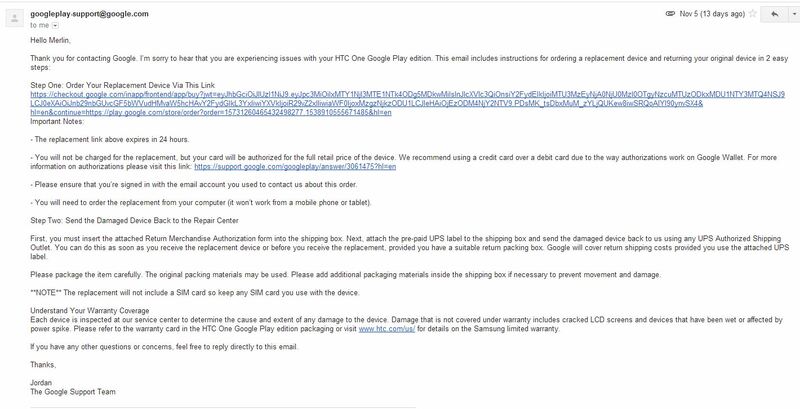 I then sent back my defective HTC One ,with the shipping label they provided. Overall I was very impressed with Google’s warranty department. Keep up the great work! This entry was posted in More, Tips and tagged Google Play Edtion, GPE HTC One, HTC One, Warranty on November 18, 2013 by Merlin Halteman. Question about the warranty claim. My HTC ONE GPE is also experiencing problems (speaker crackling and pixel problems). However, the item was purchased by a friend as a birthday gift. How would I go about claiming the warranty exchange in this case. Do I have to have give the purchasers info/ receipt or can I just give my info and credit card? Thank You for this post by the way. I believe it would be covered. This is pure speculation since I had bought my own device, but I believe if you were the first person to sign into that phone with your Google account they will associate that device with you.Let me know how you make out and Good Luck! Thanks for this post.My HTC ONE GPE stopped turning on and I was wondering how to go about replacing it.This post helped me more than anything on HTC or Google’s site.I called Google and the processes was similar to what you described.My replacement should be here shortly.